We vacated our tiny rental house in old people's land, downtown Wausau, and began our much sought after fairy tale a year ago. Our new Hobbit House was a foreclosure that had been vacated for a year - Hobbitless, you might say. 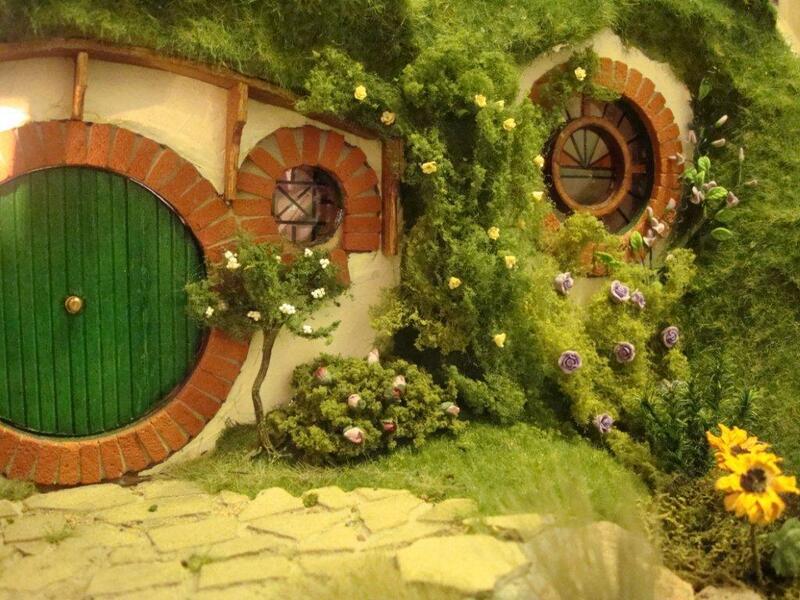 There is something to be said for the hominess of a Hobbit Hole. I wanted my home to be cozy and homey like Bilbo's. Fortunately the structure the house was decent - it just needed a little TLC and I had to get my vision. 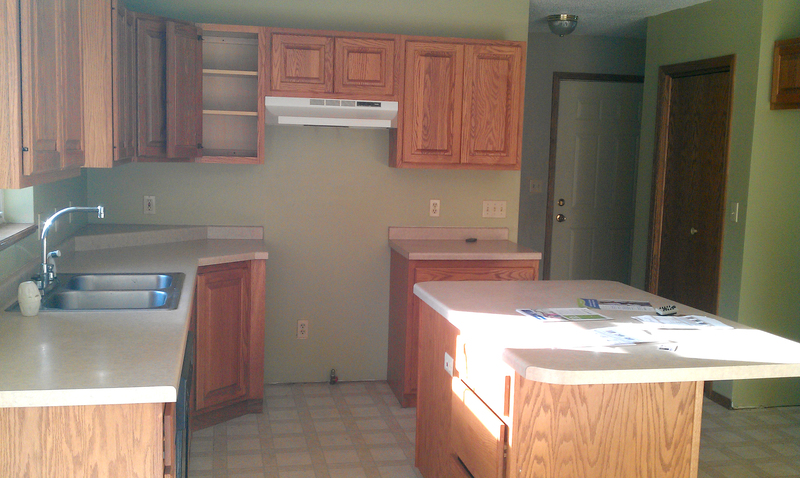 Here are before pictures. Not bad, but not what I call home. And certainly not fit for a Hobbit. NOTHING short of fairy tale is good enough. My home is where my grandkids and I were going to snuggle and read stories and have adventures. This is where my family and friends would visit to find good food, warm acceptance and encouragement. 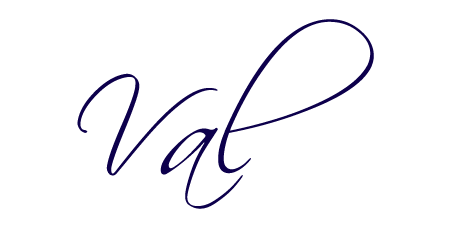 I'd spent years doing without (my choice), being practical (my choice again), and putting aside my desire for a DIY decorated haven (once again, my choice). This is my time. This is my day. This is my Hobbit Hole. This is my fairy tale. I just had to make it so. 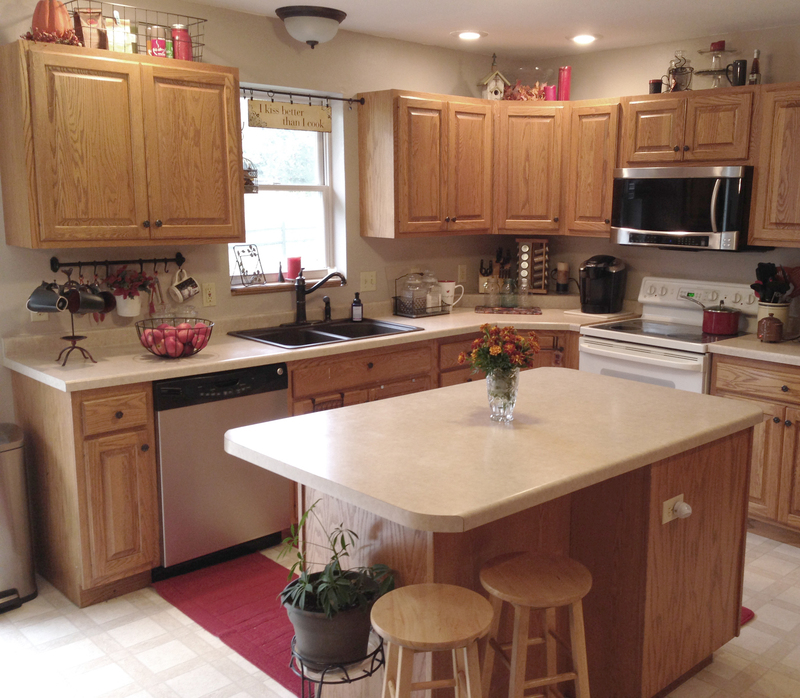 I prayed for specific things and got more - I got a house that perfectly suited our needs. It had the potential to be everything I prayed for. We painted every room before we moved in - I knew if we didn't, I'd be stuck with a whole house painted by sponges in crazy colors. This was my first ever experience with painting, well, walls anyway. I got a crash course along with some help from friends and family. My DH had a whole list of other things that had to be done in 30 days, including the roof, a requirement from our mortgage company. I had to get to know my paint and paint brushes really well; we're sorta friends now. Here are some "after" pictures. It's a "smile whenever I walk in" kinda room for me now. Since we had tons of kids for many years - yes, I said tons - it was more like cooking for an army. No creativity needed - just buckets of food and make it fast! But it's different now. I love my kitchen. I create. I have the tools I need and a pretty place to use them in. I highly recommend it. 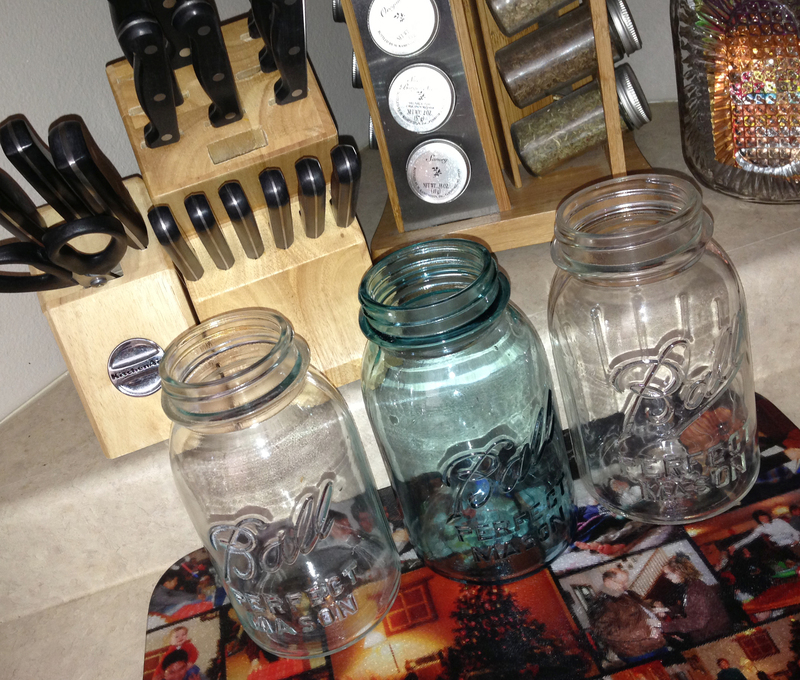 You know, making your kitchen a place that makes you smile when you walk in. Each piece of deco was either a DIY project, bought at 50% off or less, given to me as for a gift or bought by my hubby to make me happy. 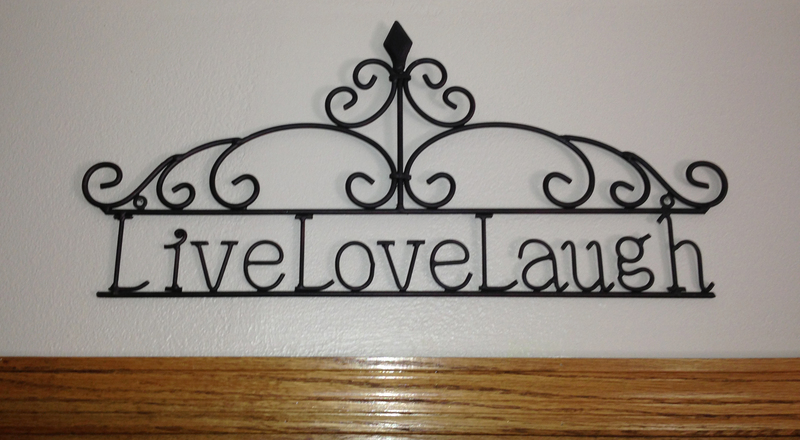 There is meaning in everything around me when I am in my kitchen. Almost everything has a story or memory. That's what fairy tales are made of. What's in your Hobbit Hole? Of what are your fairy tales made? Thanks for visiting Love My DIY Home! This is BEYOND awesome, Val!! I LOVE it all!! So many unique touches, making your space SO homey and inviting!! Just great!! 🙂 Besides that totally spectacular fridge!!!! 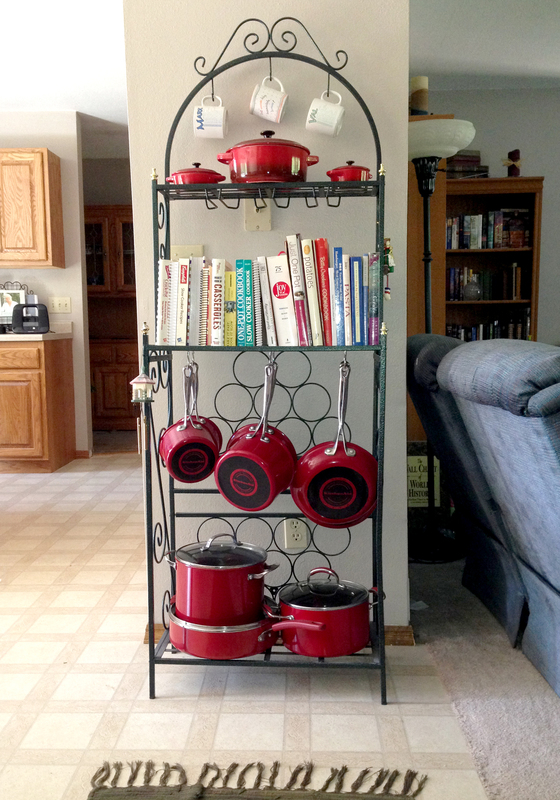 :D, I especially love that rack where you have some pans and cook books stored!! That is a brillant idea! 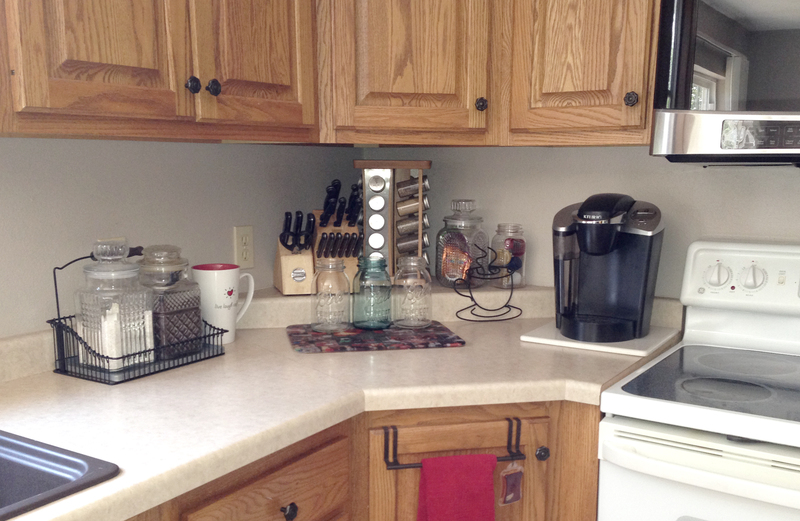 We have a small kitchen space and something like that could help a lot for added storage! Although… where would I put the rack itself… 😉 Anyway, awesome project!! I am quickly learning that when you do a project yourself, designing and working hard, you really appreciate it so much more when it's complete!! It makes you really SMILE, like you said!! It doesn't have to be an entire room (although I am ALL for that! ;)) but even just small DIY touches make so much difference!! Thanks for sharing your post!! Thanks Jessica! It was such fun to do, and like you said. the warm feeling you get when you look around at what you’ve done is worth all the work – not that I considered it work, more like play! Thanks, seester! It is all about the special memories and treasures. Warm and inviting, Val. It reminds me a little of ours. 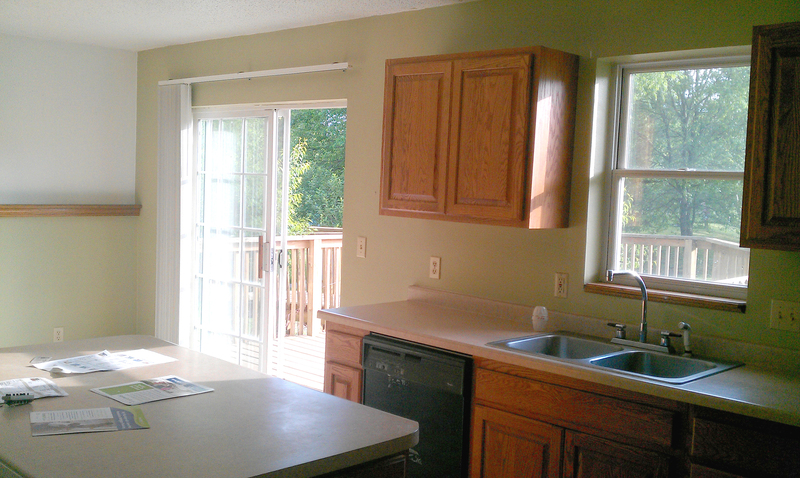 We completely gutted our kitchen six years after buying our house. 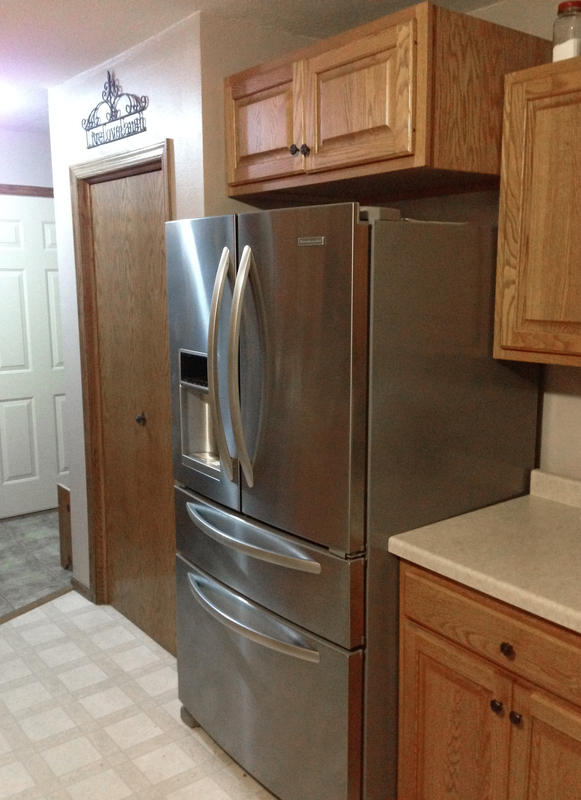 Used the one in the basement those first years as the main level kitchen was in very bad condition. Had to take off all layers of flooring since previous owners had water damage from a leaking sink. Very odd to look down and see the basement before new subfloor was put down. Also took out the soffits so that we had more space for a few of the upper cupboards as well as putting items like my duck collection on others. We also put in an island that is great for prep work! 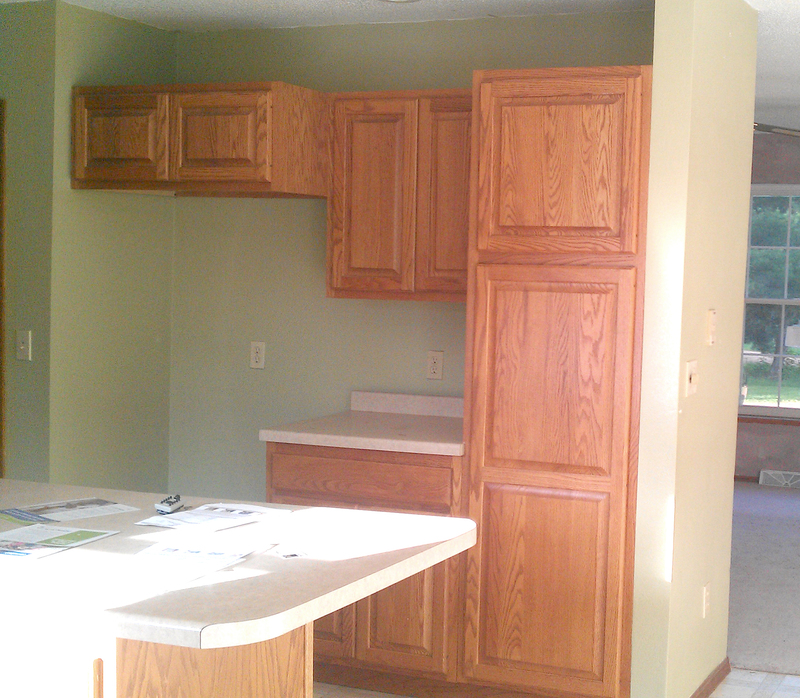 We used to have seating on one side of it but now have a breakfast bar with the bar stools. 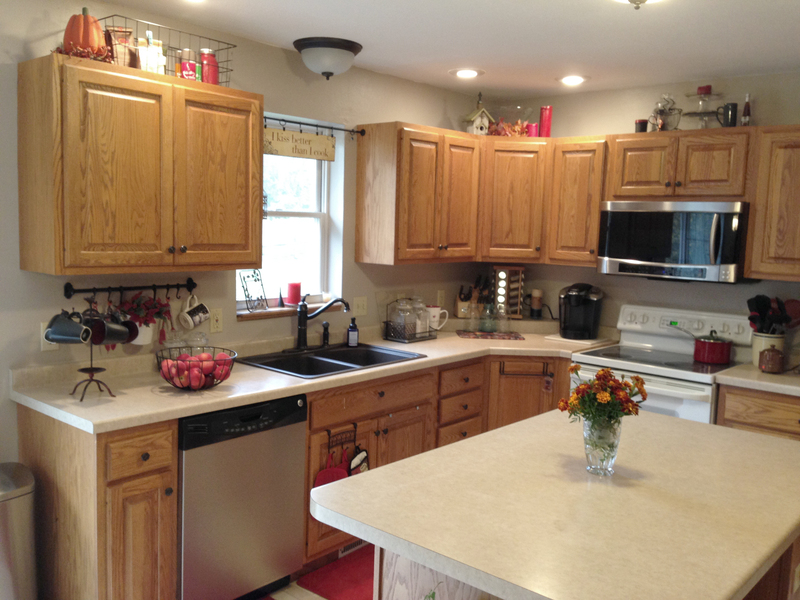 I would like to see before and after pictures of your kitchen Mary-Margaret – you did take before pictures, didn't you? I hope so! I love my island – I had no idea how much I would enjoy having one. That is an amazing job.I love all the decor and personal touches, but most of all the red pieces! 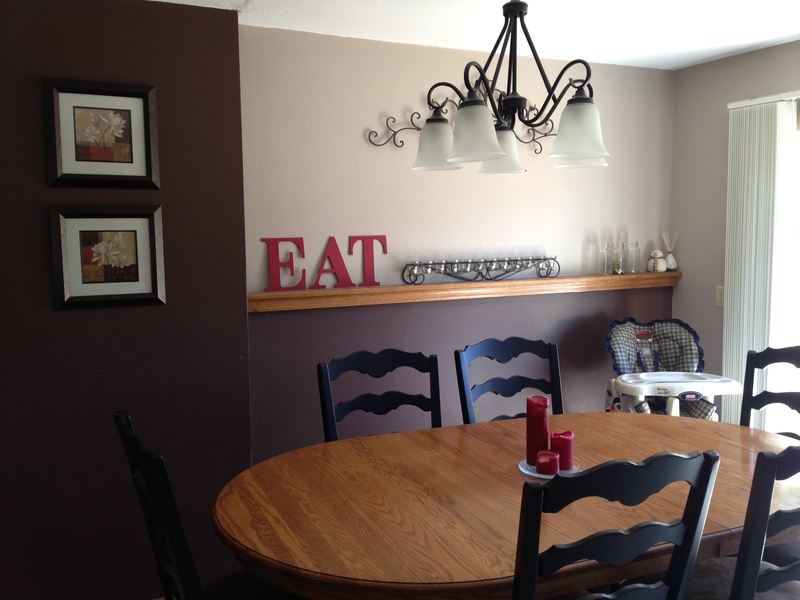 Thanks Chrystal – the red accents came in handy today as I decorated the kitchen for Christmas! @Melissa, thanks for following me – I too love the PINcentive Blog Hop. I think it’s one of the best out there. 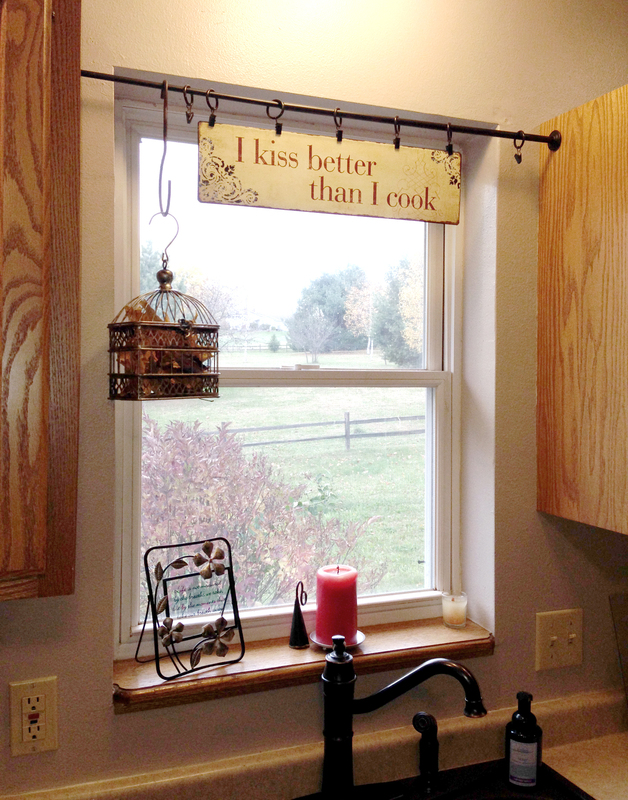 I love how you used the curtain rod above the sink!!! What a cool idea! Ha! My DH said he would never comment on my sign because whatever he said would get him in trouble!